Unfortunately, waxing comes with a pretty bad reputation. Painful during? After? Or even the next day? Luckily for you, here at Polished in Plymouth, we use Waxperts™ for perfect waxing. Waxperts™ was founded in 2012 by Ellen Kavanagh Jones and her business partner Trish O’Brien in Ireland. They were pretty fed up of going for waxes with regular wax and afterwards feeling discomfort and irritation, so they created Waxperts™! It is specifically designed for everyone, even people with the most sensitive of skin, it’s gentle, luxurious and most importantly practically pain free because of its unique blend of ingredients such as Lavender and Camomile in all three cleansers and the wax itself. With all Waxperts™ Hot Wax treatments, the area to be waxed is first cleansed and then barrier oil is applied. This doesn’t only hydrate the skin but it also ensures that the wax only adheres to the hair (as it sets, it shrinks and wraps around the hair) making the whole process much smoother. If you’ve had waxing done before, especially strip wax for Hollywood’s, Brazilians and underarms, you’ll know the horrible feeling of the stretch before the removal. The skin feels dry, raw and vulnerable. With Waxperts™ Hot Wax, luckily, that feeling doesn’t exist. Due to the oils applied to the skin, it remains hydrated and smooth at all times. After it has been removed, pressure is applied immediately and then the area is wiped with a cool cleansing pad. With all waxing, it is likely you will see some redness, after all, we are removing a hair bulb that is larger than the follicle it has to go through! This goes down after a few hours. A lot of our clients come in during their lunch break or even before a day at work! 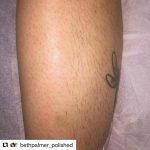 Your first appointment will see a little discomfort, especially if you have been shaving for a long time. For the appointments that follow, the hair will grow back finer and weaker, meaning that the process will be much quicker and with less and less discomfort each time! Teaming up your appointments with the Waxperts™ Wonder Pads will help to enhance your treatment even more. Hyaluronic Acid within these pads helps to boost your skin’s natural hydration levels and adds additional moisture at the same time. Salicylic Acid breaks down and removes dead skin cells helping the skin to feel smooth and fresh. The Wonder Pads are a great 2in1 exfoliator and moisturiser, especially for those of you with hectic households! For £10.50 you get 40 pads which, depending on how often you choose to use them, will last you a fair old while! They are also fantastic at preventing in growing hairs and removing them if they are already present. We keep our Beauty Room nice and toasty to help you feel as relaxed as possible. We supply products in case you would like to ‘freshen up’ and you are given complete privacy to prepare for your treatment. For those of you interested on the hygiene side of things (we are aware it can be a massive deciding factor when choosing where to get your treatments done!) we DO NOT double dip! Meaning that once a spatula has touched your skin, it DOES NOT enter the wax pot again. After each client, tools are sanitised and sterilised, couch roll and towels are replaced and surfaces are wiped down. Plus we always wear fresh gloves too!! Beth did a wax for me today and it was by far the best wax experience I’ve had! She’s so friendly and put me at ease! She’s quick and they use modern pain free techniques. I strongly recommend going to Polished for any treatment as the ladies are lovely and welcoming. I’ll definitely be back! I’ll never have ordinary wax again! So painless, I even asked when she was going to finally take wax off, only to find out lots had already been done! Beth was so friendly & made me feel so relaxed and at ease. Really couldn’t recommend highly enough, you definitely have a returning customer! I have extremely sensitive skin so waxing and shaving has always been an absolute pain. Until Kelly recommended trying their wax. WOW i was blown away. It beats the 4 to 7 days of pain i use to experience (due to skin sensitivity & poor client care). I laid down (relaxed) and was able to have a conversation with Beth. I think the reviews speak for themselves don’t they? At our salon in Plymouth our waxing prices start at just £12, you’d be crazy not to try it out! Still have some questions? Call 01752 261637 and have a chat with us! We all have waxing treatments as regularly as we can with our busy schedules so we can give you our honest personal opinion and help guide you in the right direction.